I decided to start a new series of posts here at TAT. This one is completely original and not a cheap imitation of Jaz's American Dresdner. 🙂 The title of this series is "Fun Facts." It will be a collection of interesting (and fun) facts about Shishmaref that do not necessarily fit into the "Pro" or "Con" category. 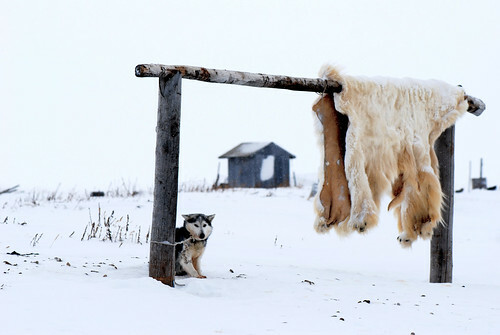 The first fun fact is that there are lots of dead animal skins in various places around our village. Most of the people here hunt. A lot. They eat traditional foods and use the skins to make traditional clothing (more on traditional clothing in an upcoming post....I bet you're excited...). 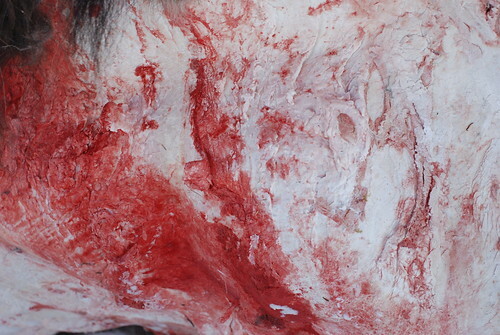 As such, there are frequently dead animal remains in prominent places. This was shocking to me at first. I might have grown up in Idaho, but my none of my immediate family members were hunters (I do remember that one year my parents let one of their friends hang a deer in our garage, the thought of it still creeps me out to this day). So, I've pretty much avoided dead animals in any form other than pre- butchered, wrapped in cellophane, and sold at Albertson's. It took a little adjusting to be able to walk around the village and not gawk or gag at the sight of various carcasses and/or remains. But, it's become so commonplace that I rarely even notice anymore. In fact, the musk ox skin at the top of this post was just across the street from us for days before I noticed. If anybody ever accuses me of being a prissy pansy princess, I want you to e-mail them this picture of me touching musk ox fur. 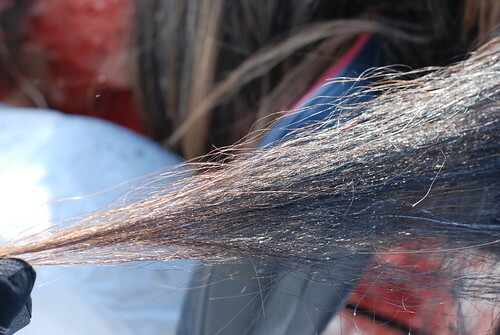 (You might be inclined to point out that I wasn't actually touching the fur/hair because I had my gloves on, but I promise that had more to do with the subzero temperatures than being afraid to touch the long, coarse, nasty hair. Thank you.) 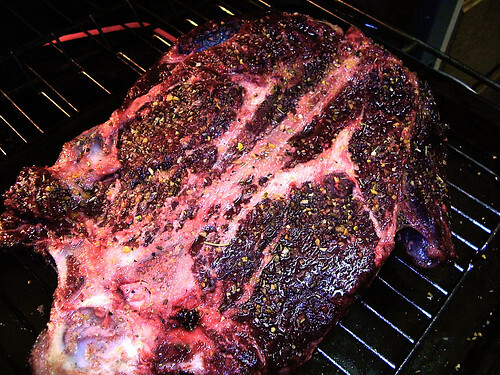 I actually have quite an appreciation for dead musk oxen because they are YUMMY. 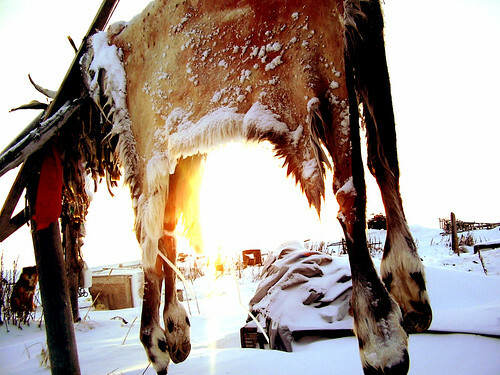 This is a caribou skin. Steve and I have caribou stew sometimes. It tastes pretty much like beef. It has a really mild flavor, not gamey at all. 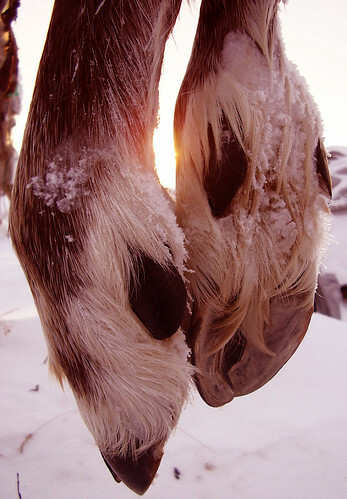 In case you didn't get TMI about the caribou, above is a closeup of the hooves. 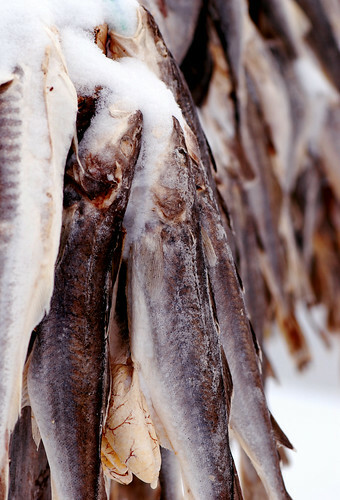 Being in Shishmaref has exposed us to more dead animals than we've ever seen before. I'm mostly okay with that.